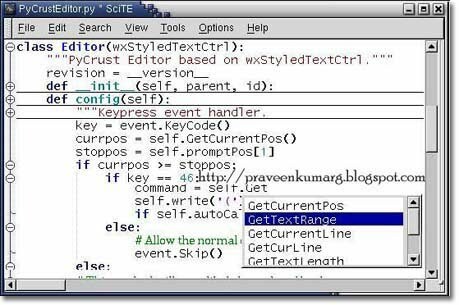 SciTE’s initial configuration only allows one file to be in memory at once but this can be modified by changing the value of the buffers property.Rectangular regions of text can be selected in SciTE by holding down the Alt key on Windows or the Ctrl key on GTK+ while dragging the mouse over the text. There are two panes in SciTE, the editing pane and the output pane. The output pane is located either to the right of the editing pane or below it.Initially it is of zero size, but it can be made larger by dragging the divider between it and the editing pane. The Options | Vertical Split command may be used to move the output pane beneath the editing pane.